It was absolute rubbish. Never going again. The people were just awful. There were no fireworks. These are just some of the phrases that weren’t written by me in a text I sent to the missus to tell her what a great time I was having at the 2018 PMC Summer Fly-in. Actually, that's not strictly true as the fireworks phrase did in fact get mentioned later … but more about that shortly. After my drive from the Brecon Beacons, I arrived Friday lunchtime expecting to find a relatively empty field. What I actually found was a campsite full of people who very much looked like they’d been there since the last fly-in, all happily getting on with fly-in life. I noticed the posh toilets had made a return, along with two porta-loos adjacent to the signing-in tent (which later also became the beer tent). The fire pit was in position awaiting darkness, ignition and an audience. It wouldn’t be long before the food truck and pizza wagon would both be set-up. Simon was nearby, all smiles and clearly enjoying one of his favourite things - organising fly-ins. Little Col was working hard, also making sure it all happened. There was still a lot of choice for pitching so I was honoured to pitch-up right next to the nicest guy in the universe, Dickie Welham, who was there with his family. Despite a lot of people already being on the site, more continued to arrive and I was very pleased to see Baz Root turn up quickly and also a guaranteed source of merriment, Lee Jackson. Lots of pitching and unpacking took place during the afternoon followed by fuelling and preflighting. And the sun beat down. Also on the scene was Connor Amantrading - I hadn’t seen him since we had his post-accident surprise get-together in the cold and wet of Membury Airfield, back in February. He was planning to be flying this weekend - and it wasn’t long before he did … and did again… and again … The launch field began to get busy and a lot of pilots were airborne for Friday evening. Richard Whitmarsh also arrived, but he had flown in brandishing his shiny new Microlight licence and very generously took people up for flights over the weekend. What a gentleman. Simon was telling everyone that he encountered about the fireworks - We all knew how much work (and cash, no doubt) had gone into preparing for this year’s fireworks display, but there was a hitch - Owing to the extreme lack of rainfall in recent months, the parched ground was a very high fire risk and unless we had some serious downpour before Saturday night then the fireworks would not be happening. We all hoped for a massive downpour followed by fabulous flying conditions, being the optimist that we are. As the light faded, the fire pit became the usual focus for a lot of people. Ironically, the firepit caused no fire problems at all, but rules is rules. We also had to enjoy (or endure) a comedian who had probably never played to a poorly lit corner of a field with an iffy sound system and a half-interested audience. His magic tricks didn’t work (I couldn’t work out whether they were supposed to or not) but the audience was good-natured and he finally finished and the music went on into the evening. Prior to the comedian, we had a short speech from George, the land owner. Earlier, there had been several instances of pilots flying over areas we had been asked not to and the neighbouring chicken farmer and some residents in the nearby village were not overly happy. George was very laid-back but asked us to refrain from flying before 8.00 am in the mornings, and to avoid certain areas. It was all more than reasonable and everyone seemed happy to oblige - after all, it was his land and without him we’d not have been able to fly from here at all. The following morning many of us awoke to the sound of two paramotors taking off at 6.00 am. So much for George’s polite request. Fortunately, the rest of the fly-in's pilots respected the 8.00am start time and a little before 8.00 the launch field started filling up. Being later, the air was a little more bumpy but the sky was soon full of paramotors, all heading off for some fun. Our very own marshal, Andy Stuart, who in real life keeps us safe in his work as a rozzer, reprised his role of the previous evening and donned his fluorescent jacket to make sure everyone taking off and landing was part of some controlled chaos. Jason Mead-Blandford, and even Connor (between his many stints in the sky) could be seen in high-vis and helping keep everyone safe and organised during the day. The usual friendly vibe was prevalent throughout and it was nice to see a lot of new faces at the fly-in; the word has clearly spread. As ever, there wasn’t a bad word uttered about the fly-in… other than about the early morning pair and the fact that one or two other pilots seemed to be unable to understand the rule regarding not flying on or above the active runway. 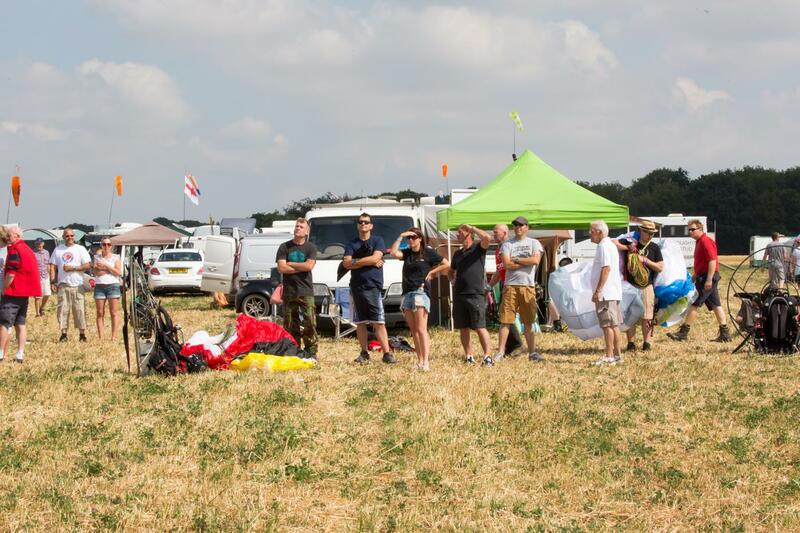 With the usual arrangements for making it more than a bunch of pilots in a field, the food facilities were very good and popular, with Killins Kitchen providing the nosh … despite running out of chips on Saturday night! And Platinum Bars did a great trade in liquid refreshment throughout the weekend. As has been widely circulated on the internet, The Red Arrows came over on Saturday afternoon and gave a us a brief private display. Simon had registered a notam so the thoughtful Arrows ensured that during their trip to The Air Tattoo they came directly over us and gave us a burst of smoke. Then, almost unbelievably, after they passed over the field they formed into two arcs, which more than one spectator observed looked like they were forming the shape of two paramotor wings. I’m happy to believe that’s what they did . As usual, tandem flights were available to those who weren't pilots themselves, and there seemed to be an endless stream of people waiting for their turn. At my count there were three tandem pilots, with the majority of people being taken up by Clive Mason. Also of note was Lee Moss who, in an amazingly short timespan, has become a tandem pilot - and for his first flight without his trainer (Clive) he took best mate Danny Kellett up. The Yeeehaaa as they came overhead is still ringing in my ears! The weather held good and hot which ensured lots of summer holiday feel - and also lots of thermals. It also meant that the fireworks were definitely not going to happen. They would have been spectacular but the fact that they didn’t go ahead had no effect on the mood, especially as Saturday evening gave some great flying opportunities which everyone took advantage of. Sunday morning was another late start, owing to the 8.00 am imposed limit. But plenty got up in the air. Gradually the camp broke-up during the day and by mid-afternoon only a handful of people remained. It had been another great success for Simon and PMC with the usual mellow atmosphere, great facilities on a great site and, best of all, so many genuinely great people getting together. Special mention must be made to the set-up (and take-down) crew, including Colin Borland, Colin Baker, Gary Higson, Andy Stuart, Andria Stuart (set-up crew food) and Connor Amantrading. And not forgetting The Red Arrows. With a great weekend behind us, all eyes are now on the Severn Bore Fly-in.